RAWALPINDI, Pakistan (AP) — When Pakistan’s military spokesman held a press conference earlier this month on emerging threats, Matiullah Jan, a journalist who has written critically of the judiciary and the military, was surprised to see his own picture flash on the screen. The spokesman, Gen. Asif Ghafoor, said Jan and a handful of other journalists and bloggers were anti-state and anti-military. Those are serious allegations in Pakistan, where the military has ruled, directly or indirectly, for most of the country’s history, and where rights groups say it is waging an unprecedented campaign of intimidation ahead of next month’s elections. Analysts say the military and a powerful spy agency are trying to maintain their power amid an unusually long period of civilian rule. The July 25 vote will mark the first time the country has held three consecutive elections without a coup, but the armed forces are still believed to wield considerable power behind the scenes. The security apparatus has zeroed in on the ruling Pakistan Muslim League, the party of former Prime Minister Nawaz Sharif, who was forced to step down last year after leaked documents from a Panama law firm revealed he and his family had undisclosed assets abroad. Sharif was banned from politics for life and was also ordered to step down as the leader of his party. Sharif has denied any wrongdoing, and supporters say he was punished far more harshly than other politicians found guilty of corruption. They have suggested the military is going after Sharif because he had criticized its efforts to combat extremist groups. “The heavy handedness is to achieve a certain result . . . they don’t want a strong government and parliament that can legislate the judiciary and military,” said Gul Bukhari, a social media activist who was kidnapped earlier this month and held briefly before being returned to her home blindfolded. Bukhari refused to identify the culprits but said the experience was terrifying. 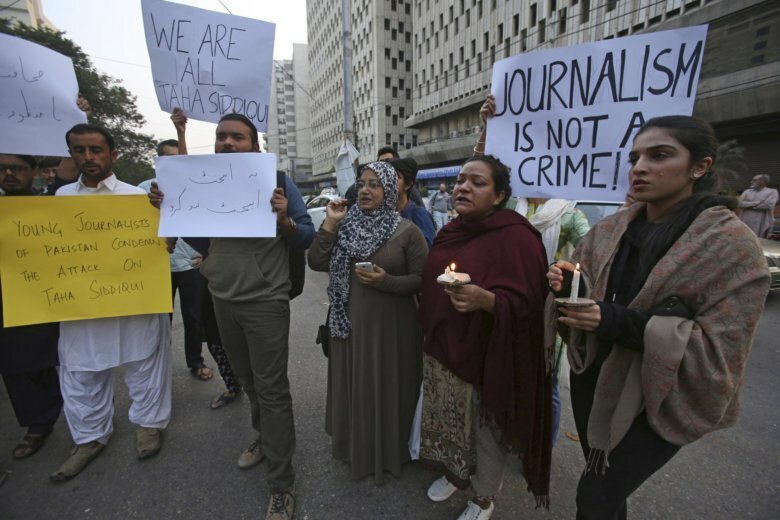 Other journalists and bloggers say they have been similarly targeted after speaking out. Ahmad Waqass Goraya said his parents were “terrified” after agents with the powerful Inter-Services Intelligence twice came to their home and threatened to arrest them if he continued to criticize the military. “Straightaway they said they were from the ISI,” said Goraya, who fled to the Netherlands after he and four other bloggers were picked up earlier this year. They said they were held by the ISI, tortured and threatened with blasphemy charges, which are punishable by death and can incite mob violence. Marvi Sirmed, a journalist and rights activist, returned from a holiday earlier this month to find her home ransacked. She said the culprits made off with two laptops and travel documents but left behind expensive jewelry, indicating the break-in was politically motivated. She had attracted the attention of the ISI by promoting friendlier ties with Pakistan’s archrival India and by criticizing militant groups with links to the security forces. The International Press Institute, a Vienna-based advocacy group, has described an “unprecedented” campaign against critical media, including intimidation, kidnappings and threatening phone calls. It says many outlets have been pressured into self-censorship. Ghafoor, the military spokesman, denied the allegations of intimidation and said the military is committed to democratic civilian rule. He also denied he was targeting journalists at his June 4 press conference. The Election Commission of Pakistan, a civilian body, has asked the military to deploy 350,000 serving and retired personnel to secure the July 25 elections for the National Assembly and four provincial legislatures. That’s nearly five times the number deployed in the 2013 elections, when attacks by extremist groups were far more common. The troops will be stationed inside and outside polling stations, according to two election workers who spoke on condition of anonymity because they were not authorized to speak to the media. S. Akbar Zaidi, a professor at Columbia University as well as at the Institute of Business Administration in Karachi, says civilian governments have grown more assertive with each successive election, a “slight and often subtle” change. Associated Press writers Munir Ahmed and Zarar Khan in Islamabad contributed.